Several years ago, my husband and I took our daughters to the pumpkin patch. I had recently purchased a new camera and was quite excited to use it. My husband (who didn’t like the new camera) brought our old camera along. So, there we were at the pumpkin patch, each of us with the “best” camera in hand. The pumpkin patch is a great place to take pictures. 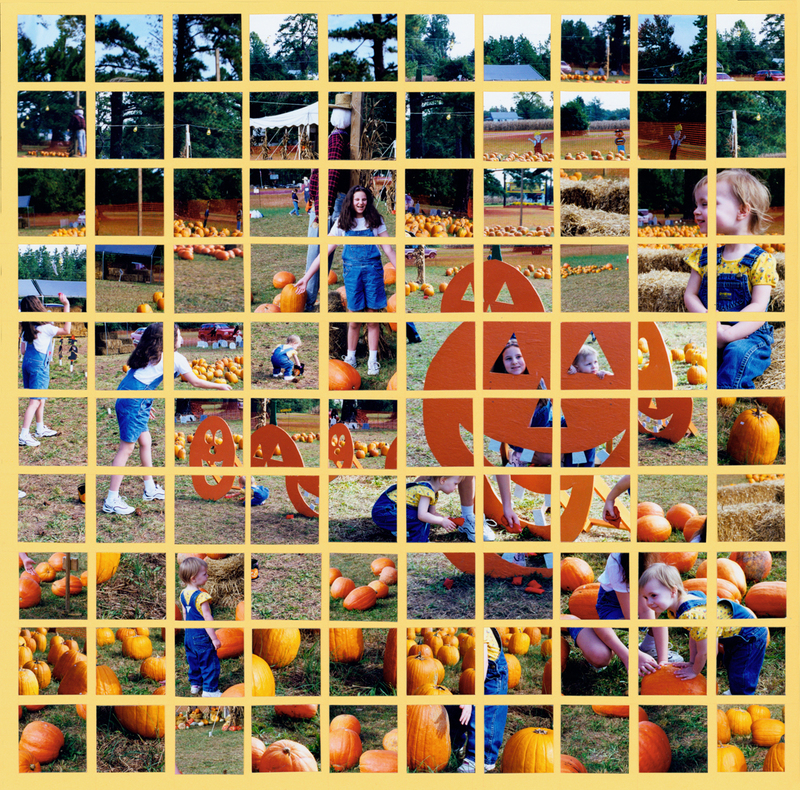 Children, dressed in denim, surrounded by vibrant orange pumpkins “beg” for a photographer’s attention. In a wink and a flash, our fingers had clicked through several rolls of film. I thought I had some great pictures, and a few pumpkins to dress up our holiday. Little did I know where that day would actually take me. When I got my pictures, I laid them out trying to decide which ones I would use to make a scrapbook page. There were so many fun moments! How could I decide? Here I was, trying to capture an hour of movement and activity on a 12×12 page. I remembered a film I watched in college about a photographer who had taken a bunch of pictures over a period of time in a defined space (in a room and a backyard.) He displayed his photographs in overlapping layers that mimicked viewing the entire space. I thought it was intriguing how it showed the movement of people/subjects over time. His fascinating methods were the inspiration for my first Mosaic Moment™.